At Christmastime, it’s not difficult to find folks who are “up to something good” around here. Meet some volunteers who believe the holiday season is an especially important time for us to serve one another. Volunteers prepare to serve a Thanksgiving meal at Court Street United Methodist Church. The Christmas season causes some of us to feel pressured and panicky, but when we focus on the reason for the season, that panic falls away and we discover joy. The Christmas Spirit is all about taking the message of Jesus Christ to heart, by serving one another in love. People in our region have a long tradition of generosity, especially during the holidays. Here are just a few ways the Christmas Spirit is alive and well in the Old Northwest Territory. This congregation and its many friends throughout the community know how to serve others in love, quite literally. For the 35th year, more than 150 volunteers will prepare, cook and serve a traditional Thanksgiving Day dinner for hundreds of people who are alone and/or homeless. A downtown Rockford fixture founded in 1851, Court Street United Methodist Church, 215 N. Court St., has one of the longest-serving congregations in northern Illinois. New volunteers are always needed for the Thanksgiving event, but many people have served since the beginning, and their children have grown up wanting to be involved. People start calling the church in August to sign up, eager to be part of the event, says Nancy Stanis, volunteer coordinator. Nancy and her husband, DuWayne, have helped to plan the Thanksgiving meal for more than 20 years. For the past nine years, DuWayne has been the director. The idea began with the late Doral and Lois Falconer, parishioners who envisioned a time when no person in Rockford would be hungry on Thanksgiving Day. Each year, the number of people served has grown. “I just love to see people’s faces,” says DuWayne. “Everyone is talking and having fun and they don’t even know each other. It’s a great feeling to know you had something to do with making people happy. I just love to help people.” Now 80 years old, DuWayne has been a member of Court Street for almost 60 years. During his working years, DuWayne was a friendly face behind the counter at the Broadway U.S. Postal Station. Even during the busiest holiday times, he welcomed people with a smile, helping them to get their packages, stamps, cards and letters out the door. Serving people is just something he can’t stop doing. As he flips through a spiral notebook filled with names, numbers and lists of what needs to be done to make the Thanksgiving meal a success, DuWayne is fully aware he has to scale back his ambition this year. His spirit is willing, but he’s recovering from a heart attack that occurred less than a month ago. He’s under strict orders, mainly from his wife, to slow down and learn to delegate. 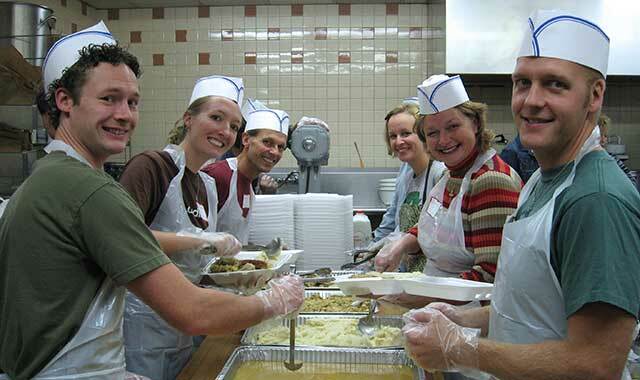 “I can’t imagine not being a part of the Thanksgiving meal. I will do it as long as I can. I plan my life around that day,” he says. On Thanksgiving Day, hundreds of people file into the church for the meal from 11 a.m. to 1 p.m. They’re given a number and are seated in the chapel, where they sing traditional Christmas songs led by choral conductor Martha Bein. The director of music and worship at Our Savior’s Lutheran Church, Bein has extensive experience in conducting, vocal performance, musical theater, education and church music. For more than a decade, she directed the Mendelssohn Chorale, which was often the featured chorus for the Rockford Symphony Orchestra. On Thanksgiving, Dorothy Paige-Turner will play piano and Jodi Beach Trio members will provide dinner music at Court Street, as they have for more than 20 years. “We want to help people feel thankful, even though they’re having a difficult time,” says Beach. “We want to bring joy to them, lift their spirits, and make them feel special and loved. Planning for the event begins in September. Committees meet weekly, until everything falls into place. It takes about 60 turkeys, 100 cans of green beans, 30 banquet-size pans of stuffing, 28 pans of mashed potatoes, 38 gallons of gravy and 160 pies. Last year, Meijer’s grocery store donated all of the turkeys, a $2,500 value. And DuWayne says it wouldn’t be possible to do what they do without Maggio Truck Center, which donates the use of a refrigerated truck each year, for the safe storage of purchased food and food prepared in advance. This will be the second year guests will be seated and served at the tables, rather than going through a buffet line. Since 2006, Second Congregational UCC/First Presbyterian Church of Rockford has helped with the cooking and carving of turkeys. The Salvation Army shows its Christmas spirit year-round. Majors Mark and Teri Martsolf were appointed to Rockford four months ago. They’re looking forward to their first Christmas here and the many ways they can serve the community. They’re already impressed by the generosity they’ve seen in community members. “Rockford is No. 1,” says Martsolf. “We receive great support from the local people, and the different groups that pitch in are great. Not every place is like that. This community loves the Salvation Army and we value those relationships. The Salvation Army, founded in 1865, is an evangelical part of the Universal Christian Church. Its message is based on the Bible. Its ministry is motivated by the love of God and a practical concern for the needs of humanity. The organization’s local calendar is filled with upcoming events. Already this year, the Salvation Army has helped hundreds of students get outfitted for school through its “Clothes for Kids” campaign; about 750 coats were collected for children and adults, along with 1,100 hats, scarves and gloves, during the “Koats for Kids” drive in October. The Salvation Army provides social services to individuals and families who find themselves without basic necessities for survival. Year-round services include a food pantry, utility assistance, domestic violence help, and employment and crisis resources, at the social services location at 416 Madison St. The annual Food for the Needy Food Drive kicked off Nov. 1, at Lincoln Middle School, in collaboration with Rockford Public Schools. In every school, students decorate 55-gallon barrels with promotional messages that encourage people to donate food. The school that collects the most food will kick off next year’s food collection with an assembly. Also in November is registration for Prison Toy Lift, an effort in which toys are collected for children of people imprisoned during the Christmas season in Winnebago County. Last year, 500 children received toys. On Dec. 2, 12 Hours of Salvation will take place from 7 a.m. to 7 p.m. at Lou Bachrodt Auto Mall. The goal this year is to collect 10,000 toys for needy children. The Adopt-A-Family program is for those who want to take a whole family under their wing to ensure they have food, clothing and toys for a joyous Christmas. So far, 184 families have been adopted. The Salvation Army partners with the City of Rockford for a Community Senior Dinner, this year on Dec. 16, at the Salvation Army’s church gym, 500 S. Rockford Ave. The City sends invitations to low-income senior citizens and the Salvation Army pays for the dinner and entertainment. Elected city officials will be among those serving the elderly. All local donations are used for local people. Perhaps Salvation Army is best known for its signature Christmas Kettle program, which this year began on Nov. 4. The classic red kettle, with a bell ringer standing nearby to accept donations for the Salvation Army, will be at 32 locations this year. About $214,000 was raised last year for food and other assistance to local people. Martsolf says being a bell ringer at a local business is a privilege, not a right. Some businesses have a corporate policy not to allow bell ringers or any solicitors on their properties. “We don’t like it, but we have to respect their decision,” says Martsolf. “I’m just sorry it affects the people we try to help. It’s heartbreaking, but I trust the Lord will provide. We try to get into other places and trust the loss will be made up somewhere and the needs will continue to be met. Especially at Christmas, it’s difficult for loved ones to be thousands of miles apart, but that’s often the case for U.S. military members serving their country. Larry and Patty Hinkle know this all too well. In 1998, after Larry returned from a 20-year career in the U.S. Army, they founded The Postal Shoppe at Edgebrook Center, 1643 N. Alpine Road. Today, the Hinkles offer discounted postal rates to people sending care packages to overseas people in the military. They also collect money for the Veterans Assistance Commission. The Postal Shoppe specializes in packing and shipping freight boxes and parcels, letters and mail services. The business also has copy machines, fax services, a notary public and mailbox rental. The second store opened in 2004 at 2205 S. Perryville Road, with all the same services, plus drive-up shipping. It specializes in large and unusual items such as furniture, antiques, business equipment and more. Hinkle was sent to Iraq during Operation Desert Storm, when U.S. troops and their allies responded to Iraq’s invasion of Kuwait. Back home, he wanted to help people stay connected. “I had no idea how many people were in the service, until I started doing this,” Hinkle says. “And I was really surprised at the way veterans step up to give to other veterans. They’ve all been lonely, dirty and smelly, in the middle of nowhere or in a tent in the middle of a dessert. You don’t understand that kind of loneliness unless you’ve been there. If you’ve never been deployed, you don’t know what that feels like. Some years, Hinkle has decorated the Postal Shoppe Christmas tree with 1,200 names of soldiers, so people could take names and send care packages. Over the years, he has modified the program, but always offers a discounted shipping rate to those serving overseas with a military address. The discount is $10 for a flat rate priority mail box. During the Christmas season, care packages go out to all military personnel in The Postal Shoppe’s mailing database. In order to send the packages, donations are accepted all year long. Hinkle keeps a list of appropriate items for shipping. On it are toiletries, books, CDs, movies, foot and hand warmers, beef jerky, pudding cups, snacks, sunglasses, prepaid phone cards, lip balm, body wash, magazines, pens, paper, envelopes, playing cards, coffee creamer and word puzzle books. At times, Larry’s service to others becomes more personal. He recalls a woman whose daughter was killed overseas while serving. She came into The Postal Shoppe seeking advice from Hinkle on how to cope with the loss. Another time a local minister, whose son was in the service and in harm’s way, sought help from Hinkle on how to help his son. When people are at a loss, Hinkle enlists the help of active or retired military personnel who can relate. “I just try to use my time in the service to put people in contact with the right people. I’m glad to help,” he says. The Christmas spirit knows no age limits. Every Christmas season, student leaders from Rockford Public Schools (RPS) brainstorm about how to use their time and talent to make a positive impact in our community. They’re part of the Superintendent’s Student Advisory Council of RPS, which formed about 10 years ago. The council is made up of 15 high school students, three from each Rockford public high school, and their group sponsor, Angela Lundin, executive assistant to the chief of communications and community engagement. In past years, the council has reached out to the homeless, by providing basic necessities for living. This year, the group decided to buy gifts for children aged newborn through middle school, who are hospitalized at Mercyhealth Hospital on Rockton Avenue. The students have volunteered for the Salvation Army, Heartland Community Church’s Sharefest, and in nursing homes. They’re currently working out plans for a senior citizen prom. To be on the advisory council, students go through an interview process, fill out an application and vie to fill vacancies. Sophomores, juniors and seniors can serve on the board until graduation. While the purpose of the group is to communicate to the superintendent and to develop leadership skills, students also experience the joy of service. “You see students who don’t know each other come together collectively to make things happen,” says Lundin. “They learn from each other, about one another’s schools, and strive to work as a group to make a difference. The act of bringing hope, love and joy to others is celebrated in thousands of ways, each holiday season, inspired by the birth of the Christmas child, Jesus Christ. The Christmas Spirit is alive and well in the Old Northwest Territory, and always up to something good. This entry was posted on Wednesday, November 16th, 2016 at 11:58 am	and is filed under Features, Top Posts. You can follow any responses to this entry through the RSS 2.0 feed. Both comments and pings are currently closed.